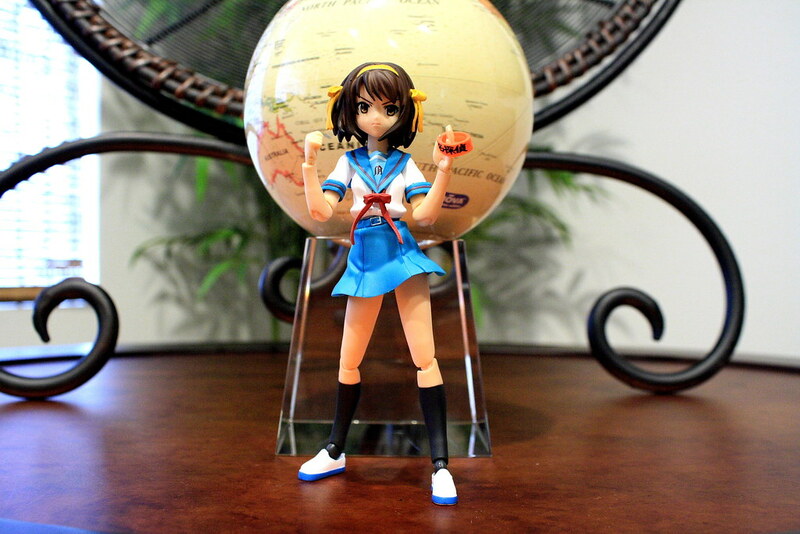 Today’s review is another Suzumiya Haruhi, bringing my collection of Haruhi figmas to 4. Yes, it’s another uniformed Haruhi, but to me, the bonus parts more than make up for the cost. Haruhi did not like it when I took this image! 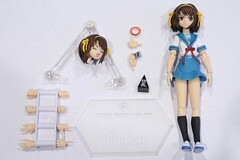 For being “another Haruhi figma” she sure comes with a lot of accessories! Standard figma accessories include the usual 3 joint stand and base and a full set of hands. Unfortunately, the accessory hand is not the same kind that came with the Cheer Girl version, and is a standard accessory hand with a hole. A bit disappointing, really. The armband she comes with reads ‘Ultra Detective’ which I use instead of the dub’s version ‘Supersleuth’ since I think it fits better. Extra hands include a thumbs-up and special hand for her digital camera for her right hand, and the ‘danchou’ pyramid that sits on the desk with the computer on it in the club room. 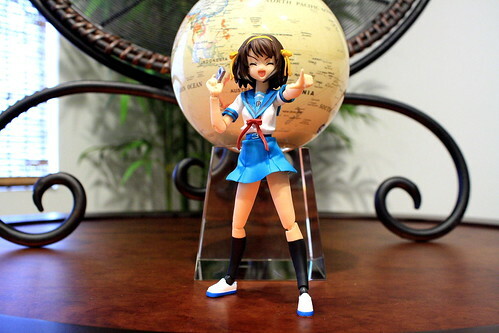 Lastly, she comes with an extra head with a small ponytail from Suzumiya Haruhi no Yuuutsu VI. Cons: Accessory hands. 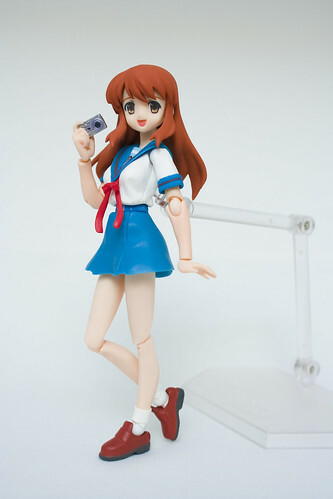 MF/GSC should’ve just set the hands used for the Cheer Girls as the default hands for all future figmas. The pyramid is a bit useless unless you have the clubroom computer set by Sega, which I’m planning on picking up at some point. The Ultra Detective armband is a nice touch, but also unneccessary. A simple mod that can be done if you take good care of your figmas. Carefully pull the upper arm off the figma joint on Summer Seifuku Haruhi. Do the same for Winter Seifuku Mikuru. A simple swap and you get Summer seifuku Mikuru! For completionists, this figma is a must. 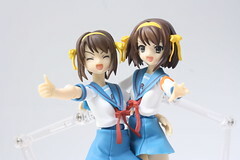 The ponytail head is awesome, and great to use, especially on the Cheer Girl Haruhi. 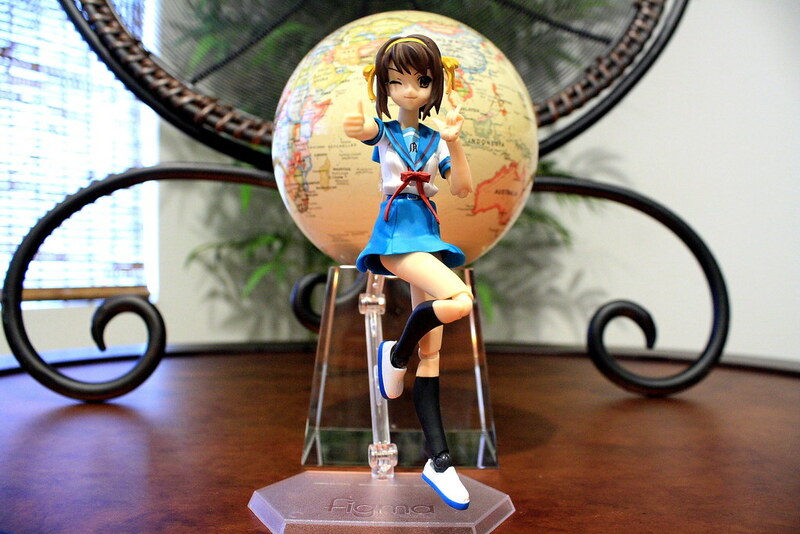 Some people might be sick of Haruhi figmas, and I can’t blame them. Given the choice between this and the winter seifuku Haruhi, I’d probably recommend this one more that the other. 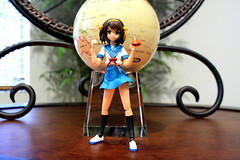 If you are interested, at the time of this posting, Suzumiya Haruhi Summer Seifuku ver. costs ¥2,261 at Hobby Search and ¥2,381 at HLJ. Enjoy! Source: Coach Vs michael kors outlet: Who Has More Runway Credibility? In Japan, revenues increased 129% to $5 million with comparable store sales are expected to come in between $1. sell hundreds of pairs of shoes are called is incredible, very classic and retro. Contemplating that the edition with the reason that with this feature, so this paragraph has turn out to be the best year for Jordanheads – ever! I see, yet another person who also thinks the ponytail is enough to buy this figma. Now that I have job, as soon as she comes in stock in Hobby Search I’ll grab her up along with a few other things. Great acquisition. :) I can see you to be an avid follower of Haruhi Ojou-sama as well. I do agree with you that she does come with welcome albeit unnecessary accessories. I love the arm band though. What I’d like to see MF/GSC come out with is Haruhi in a Bunny girl. Revoltech’s version was a bit disappointing.